Happy 99th Birthday, Marsha Hunt! The daughter of an attorney and voice teacher, Hunt and her family moved to New York City when she was three years old. She took an interest in performing at an early age, appearing in school plays and performing at church functions. At 17 (and accompanied by her older sister), Hunt moved to Hollywood to pursue a career in motion pictures. She was quickly signed by Paramount Pictures and in 1935 made her debut in The Virginia Judge. She was relegated to mostly B pictures at Paramount and when her career failed to take off, she began to freelance at various studios, including many of the Poverty Row outfits. In 1939, Hunt signed with MGM, where she was given solid parts but rarely lead roles. Her association with MGM came to an end in 1945 and she began freelance again (it was during this period that she appeared as the “good girl” counterpart to Claire Trevor‘s “bad girl” in Anthony Mann‘s classic film noir Raw Deal (1948). In 1948, Hunt decided to give Broadway a try, debuting in Joy to the World. She appeared in a number of other shows as well, including a turn as Anna in a production of The King and I. She also appeared on Broadway with Johnny Carson, in a production called Tunnel of Love. Hunt was a lifelong liberal and in the early 1950s, some of her past political activities unfairly came back to haunt her. Although she was never called to testify before the House Un-American Activities Committee, her name appeared in the infamous Red Channels pamphlet that purported to expose Communists and other subversives in the radio and television industries. She made just three films in the next eight years. Semi-retired thereafter, Marcia has devoted herself to humanitarian causes and organizations, among them UNICEF, The March of Dimes and The Red Cross. Hunt was named the honorary mayor of Sherman Oaks, California, in 1983 and still holds that “post” today. In 1993, Hunt published a book on fashion entitled The Way We Wore. In 1998, Hunt received the Eleanor Roosevelt Humanitarian Award for her charitable and humanitarian activities. 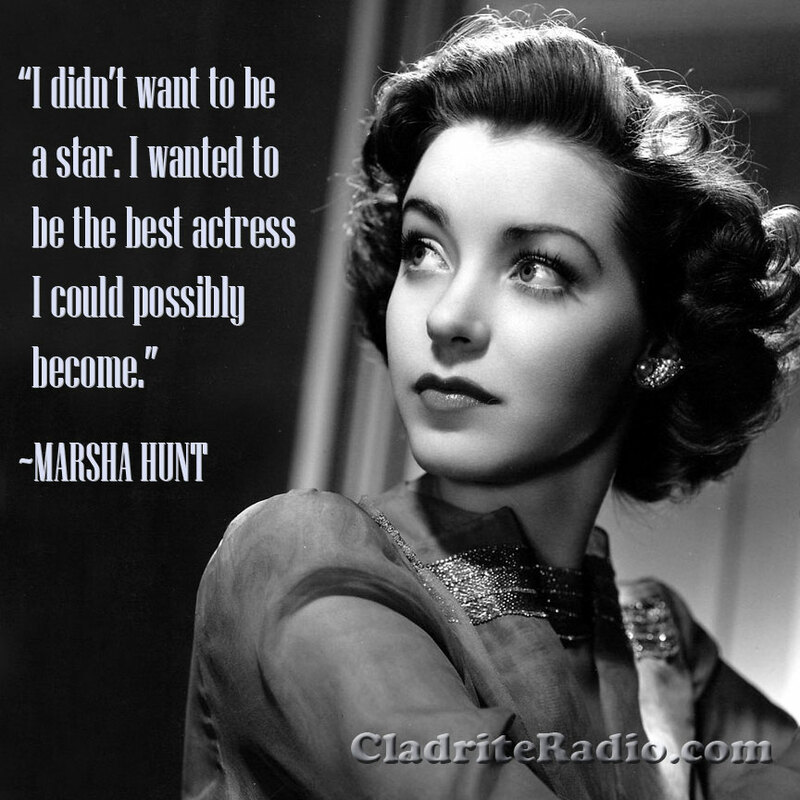 Happy birthday, Marsha Hunt, and many happy returns of the day!